Yesterday’s Pens game was a great one if you caught it. Down by 2 goals and with 45 of their best players hurt, the Pens came back to take it in a shoot-out after 43,204,232 players attempted to put one in the net. I’m only exaggerating my numbers slightly. For effect. Also in that game, Jordan Staal had a major penalty that resulted in an ejection when he noticed Ranger Brandon Prust take a shot at Tyler Kennedy (who my brother-in-law affectionately refers to as Chief Wiggum), and chose to punch Prust in the face for it. Please watch the video. Closely. That, my friends, is a dive. A big fat Greg Louganis 3.5 difficulty two-and-a-half somersaults from a backwards handstand dive. One small punch from Jordan’s gloved hand and Prust fell to the ground like someone dropped an elephant holding a hippo holding THE MOON on him. All over the world, there are professional soccer players watching that video and taking notes. I love the way he spins around in the opposite direction of the punch. I’m pretty sure the divey-ness is why Staal isn’t going to be suspended for it. It was so obviously a dive!!! I can’t believe there wasn’t a penalty for that one! I told my husband that I would write the NHL if they suspended Staal. Lol! He went down like Tyson hit him with a right hook — sadly, it was Jordan Staal with a left cross. Sir, you have violated the laws of physics. For breaking those laws, the Sports Gods will surely punish you. Oh, wait, you’re a New York Ranger. You are ALREADY being punished. The referee blew that call. Prust hit Staal first, in the head with his arm. Staal was just defending himself. Then came that the pathetic dive. It was something worthy of a Flyer. Last night’s game against the Islanders was even better as Brent Johnson (who obviously took lessons from Staal) dropped DiPietro with 1 left swing after DiPietro cheap shotted Cooke. Cathy — saw that! The fans who started leaving early because the Pens already had it sewn up missed the best 30 seconds I’ve seen in a long time. Fans, players, even some of the media people were just grinning with delight when Johnson went after DiPietro. We were watching at home, and they must’ve played his charge over and over on the scoreboard because while the officials were “deliberating” — who will we screw over this time? — with Jordan Staal standing by, the audience would let out these huge groans and then cheers. The sequence was so funny — so SATISFYING!! Thank you for this post!! I was livid when I watched that the other night! So interesting how he falls in the opposite direction of how he is punched… It also didn’t help matters that the trainer jumped to his aid right away. Seriously, give that man an oscar…and then somebody punch him for real. Not only was it a dive, it was a delayed dive. The refs should be ashamed of themselves for *ahem* falling for it. c’mon, people….I really think that prust was hurt by that punch. didn’t you see the complete trouble that he had taking a drink from that gatorade bottle? oh, the humanity. 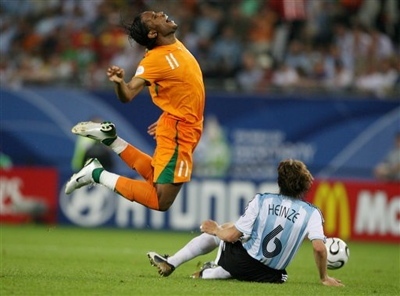 I havent seen a dive like that since the Joe Nedney fiasco a few years ago!